Last Sunday we drove up to the Kalaloch Lodge and Ruby Beach. It's an hour and a half drive from our house. Google Maps makes you think you can drive straight through the Quinault reservation to that area, but it's not true. Either there is no road or the road is not open to non-tribal members. The shortest route from our house is to head north on 1st Street, north on Highway 109 through Moclips, and then turn right on the Moclips Highway. The Moclips Highway runs through the reservation and is almost deserted. You pass a few houses at its entrance, there's a fish hatchery, and that's it. You don't see any other sign of habitation. After 20 miles you reach Highway 101 - turn left in the direction of Forks and it will take you all the way to Kalaloch. You are mostly in beautiful forest throughout this entire drive. Sections of the forest are very tall and grand where the National Park has protected it from logging. There's a memorable section leading into Lake Quinault where it looks like you are driving through a green canyon. I think the trees must be 200 feet tall on either side of you. On the other hand, the clearcuts give you a view of the wider area. At the east end of Lake Quinault there's a stunning view of the lake and the snowcapped mountains behind. In 10 years that view will be gone as the trees grow up. Near the entrance to Queets campground there's another clearcut that affords a wide view of the Olympic range. After Queets the highway runs for 12 miles along the shore. This is one of the special places on the Earth. You drive through a windswept forest with frequent peaks of the ocean and beach. There are many offshore island and rocks, including Destruction Island with a lighthouse on it. The Kalaloch Lodge sits on a very lovely site. It is perched on the edge of a cliff, overlooking a sweeping creek that has cut a canyon through to the ocean. Beyond the creek you see the beach and ocean. We were here in January. Most of the cliffside cabins were vacant and the restaurant was almost empty. We enjoyed a table next to one of the view windows - the best view from any restaurant you're like to see. Nine years ago when our twins were four years old, we stayed in the cabins and played on the beach in August. At low tide the beach had lots of warm, shallow pools to play in. It was a perfect, safe environment for kids. 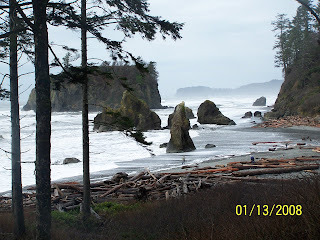 Seven miles north of the lodge is the fabulous Ruby Beach - pictured above. It has lots of interesting features: a creek, logs piled on the beach (including some very pretty red cedar logs), the windswept forest, seastack rocks offshore, lots of big rocks scattered in the surf, large flat polished rocks for skipping, and some sandy areas to play in. One of our group of guests coming up in February won a (nearly) free stay at the beach house through a charity auction for the new Stillwater School in Arlington, Washington. I found the director of the school on Craigslist.org, where she posted a request for prize donations. I didn't have any connection with Arlington or this school, but I thought I would give it a try as a bit of guerilla marketing. I offered a free off-season weekend or half price on a three day summer reservation. Everybody at the auction had a chance to see my brochure. Perhaps I'll get some summer reservations out of it. The prize winner added an extra day to their visit, so I made a bit of money that way.